I spent last night at a bar, very drunk, trying to figure out what I’d say. I’d spent the day trying to accept what I already knew—that there’d be no indictment, that justice didn’t and never has lived here. I don’t know that she ever will. I’d blind her if I could. After work, a friend and I split a bottle of wine at some place downtown. We sat outside, in the unseasonable warmth, and I thought about the heat in Ferguson on that Saturday in August, five days after my birthday; that heat from the summer that hasn’t died down. I didn’t tell my friend what I was thinking, but on the way there I told her how my body felt. My mouth is dry, I said, and there’s a lump in my throat. There is a tight low ache in my stomach. “Those are classic symptoms of anxiety,” she replied. The wine didn’t help. A few summers ago, while I was back at home in Tyler, Texas, after my first year in college—I was 18 then, Michael Brown’s last age—a few friends and I decided to go to the lake. The heat was seasonable then, hot and wet. We jumped in my friend Jamie’s car—he was always the driver—and raced 10 over the speed limit because we were young and invincible and full of life, piss and vinegar. There were a few country families who probably lived near the lake, white and southern, enjoying the water and their watery beers that come in shiny blue cans. Of course something had to change. I think it started in the air. But suddenly there was yelling and then there was a gun in someone’s hand and I was flying and I couldn’t feel anything but alive, my body on autopilot, thousands of years in the past, still stuck on the savannah plain. There were shots. I was crouched behind Jamie’s car. I called my then-girlfriend when I got home—full of piss and vinegar, still youthful, still alive, high on adrenaline—and told her what happened. There’s no record of the conversation, but I remember her being appalled. Sometimes I think I’ve dreamed the whole thing, that it couldn’t be real. How could things change so quickly? How could there have been a gun? I remember thinking I could have died and getting high on the thought. I was lucky in my first real encounter with a white man’s rage. I was on the periphery. I was not a target. Michael was. At the bar last night, after drinks with my friend, I started refreshing my Twitter feed. I was with Sanna and Bella, two Swedish friends of mine, to whom I couldn’t quite explain how I felt later, after the non-indictment. I drank two more glasses of wine. Then there was the prosecutor’s rambling. I switched to whiskey. I flew. I don’t know why I never told my parents about that day at the lake. I didn’t want to worry them, I guess, or maybe it was that I didn’t want them to know that I now knew they were right. That I finally saw the value of my life as others saw it: a cheap thing, so easily discarded between muzzle flash and hot asphalt. I am a writer. I believe words have power. Or, maybe it’s this: That I must believe words have power because this is the only thing I can do, this is the only thing I have, and I need it to be enough. Let me tell you another story. It was Nabeem’s birthday and we were headed to a club to dance and sweat with each other. I was standing beside Calah when she reached the front of the line; the bouncer looked at her ID—she’s black like me—deemed it fake, and, for some reason, rendered it unusable. He broke it in half. We called the manager and I was angry, trying and failing to explain to him why this was not okay. He told me I was too drunk—I wasn’t—and told me to take a walk to cool off. I walked to a bodega and walked back. He wouldn’t let me in. I wasn’t a writer then, or I didn’t see myself as one, though I was writing for places that people might have heard of. I finally threatened him with words. I told him I’d write about him, and that was when he became as angry as me. He finally saw me. That night we slept at Calah’s place—home, safe, black peas in a pod. 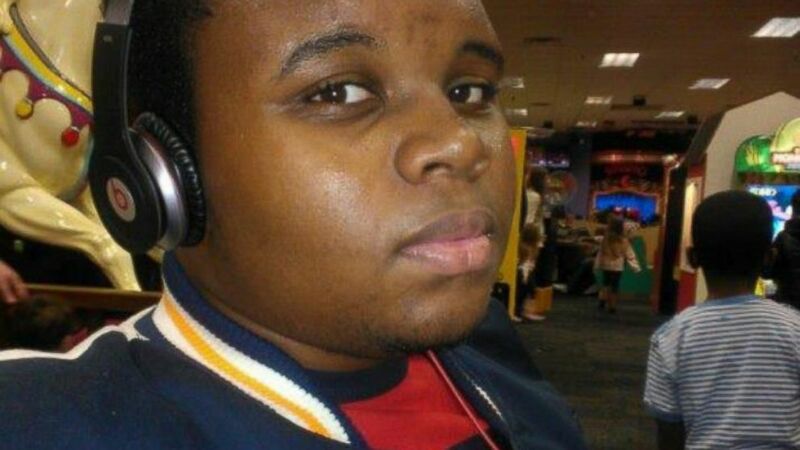 I don’t need to tell you that Michael Brown is neither home nor safe. Here’s another story. I am the only black person on the editorial floor at my place of employment. The other ones who look like me work as cleaners or in the mailroom. When we lock eyes I nod, and it is both the easiest and hardest thing in the world. I know nothing of their lives, and yet here we are the same. Today I will do this. We will share a look that encompasses last night’s indignities and acknowledges tomorrow’s. We will keep our heads down and our hearts guarded, and I will only bleed here, in words, on this page. Last night I showed Sanna and Bella that picture of Michael from his high school graduation. I looked into his eyes and I felt the heat of summer again on my skin. “I shouldn’t have to train my boy to live his life to deflect the danger of other people’s warped perceptions of him. I shouldn’t have to teach him police avoidance techniques and ask him not to act out as we did as teenagers and to willingly swallow other people’s disrespect – all to keep him breathing in a world that feels so sickeningly unfair. I will, as my black parents did before me, take on this task of training my son to both survive and thrive.